"Power From The People: Human Energy Will Fuel NYC’s New Year’s Eve Ball Drop"
A 11,875-pound geodesic sphere, covered in 2,688 Waterford crystals, illuminated by 32,256 LED bulbs, powered completely by human energy. That is what the venerated Times Square New Years Eve ball will look like this year, according to a Friday press release from the Times Square Alliance. The human energy will come from six stationary Citi Bike bicycles set up in Midtown, that people were invited to ride this weekend to generate kinetic energy for the ball. The energy, which is collected from the bikes and stored in batteries, will eventually be transferred to the New York City power grid to offset the energy needed to light and eventually drop the New Year’s Eve Ball, according to the release. “With the year’s biggest party being powered by Citi Bike pedals, the world is in for an even more electrifying experience when the ball drops,” city Transportation Commissioner Janette Sadik-Khan said in a statement. The news marks the latest green evolution for New York’s New Year’s Eve ball, which in 2008 marked its 100th anniversary by replacing its halogen quills with light-emitting diodes, or LEDs. The result, according to the New York Times, was a ball that used 87 percent fewer watts per bulb, and cut the old ball’s 30,000 watts down to about 15,000 watts. For the 2012 New Year’s Eve celebration, the ball used bulbs called AmbientLEDs, which reportedly consume up to 80 percent less energy than traditional incandescent bulbs. Philips Lighting, the maker of the bulbs, estimates that consumers could eliminate 87.5 million metric tons of carbon dioxide if everyone in the U.S. transitioned to the bulbs. Though it seems New York City will have the only ball powered by bikes this year, it is not the only city that has taken steps to make its New Years’ celebration more energy efficient. Grand Rapids, Michigan will use about 80 percent electricity for its New Years Eve ball drop on Tuesday by using LED bulbs, according a Monday press release from Consumers Energy, which is supplying the bulbs. That ball will use a little more than 24 kilowatt hours of electricity during the 6 hours it will be lit, compared to 116 kWh in past years. The press release notes that the electricity savings could power 115 active video game consoles for the same amount of time, or light 18 average Michigan homes for a day. No registration necessary. Meet 8 am Dunkin Donuts by the main door of the Stillwell Avenue and Surf Avenue/Coney Island subway station street entrance. Meet at the Ryan Visitor Center in Floyd Bennett Field, Brooklyn, NY. The bare trees and shrubs of this woodland area have exposed a winter wonderland of living things. Discover this mysterious, little known site with American Littoral Society naturalist, Mickey Maxwell Cohen. This hike will be over one mile in length. This program is in partnership with Gateway National Recreation Area. Owls are illusive, but winter is one of the best times of year to search for these birds of prey. "New Year's celebration of birds in Prospect Park"
Meet at Fort Tilden in the Rockaways for a hike along the beach and dunes. As per our 30 year tradition, at 12 noon, we will attempt to signal across the harbor to our American Littoral Society partners in Sandy Hook, NJ. Free coffee, cake and champagne afterwards. Guides: Mickey Cohen, Don Riepe With Gateway National Recreation Area Meet at Building #1 in Fort Tilden, Breezy Point, Queens. Keep up the 30-year tradition by joining us for a brisk hike along the beach at Fort Tilden to celebrate the New Year. At noon, we'll signal across the bay to a group at Sandy Hook, then hike up to the hawk watch for a great view of the ocean and New York Harbor. Afterwards, we'll visit the Rockaway Artist's Alliance for coffee, cake and free champagne. Wednesday, January 1, 2014, noon to 2:00 p.m.
Join NRPA and PPOW for a healthy start to a fantastic New Year. Participants will gather in the parking lot at Hylan Boulevard and carpool to the last lot before Crooke’s Point. From there, the group will enjoy observing wintering birds and dormant grasses while discussing ideas and concerns for the year ahead. Greetings. This is the New York Rare Bird Alert for Friday, December 27th, at 7:00pm. The highlights of today's tape are VARIED THRUSH, GYRFALCON, PACIFIC LOON, BLACK GUILLEMOT, TUNDRA SWAN, ROSS'S GOOSE, GREATER WHITE-FRONTED GOOSE, BARROW'S GOLDENEYE, KING EIDER, GLAUCOUS GULL, NORTHERN SHRIKE, and more. A number of good birds, some lingering and some found recently on local Christmas counts. 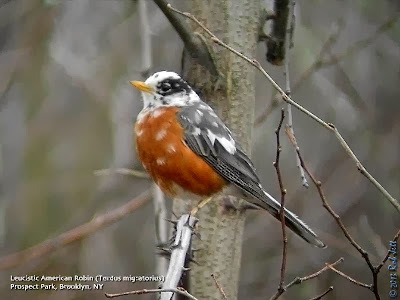 The stunning male VARIED THRUSH was still being seen in Stuyvesant Town in lower Manhattan at least to last Saturday, but we have received no reports since then. The thrush had been visiting shrubbery around the Stuyvesant Oval, east of First Avenue, roughly adjacent to East 19th Street. A gray GYRFALCON was reported again from the Cedar Beach Marina area both last Saturday and on Wednesday. Watch for the falcon perching and hunting over the marsh north of the Marina, located off the north side of Ocean Parkway about three miles west of Captree State Park. Be aware that there are also some Peregrine Falcons using the same area. A PACIFIC LOON was also seen again just off Orient Point last Saturday and seems to be lingering in that area. A female KING EIDER and SNOWY OWL were among the other birds at Orient, including Orient Beach State Park. The Northern Nassau Christmas Count on Saturday recorded 118 species, the highlights including GREATER WHITE-FRONTED GOOSE, CACKLING GOOSE, a BARROW'S GOLDENEYE continuing off Sands Point Preserve, LESSER BLACK-BACKED GULL, BLACK GUILLEMOT off Sea Cliff, LESSER YELLOWLEGS, BALD EAGLE, RED-HEADED WOODPECKER, SEASIDE SPARROW, and VESPER SPARROW. The BLACK GUILLEMOT was still present today in the bay west of Sea Cliff, best viewed from the beach along The Boulevard, which is an extension south of Shore Road. Look especially from where The Boulevard meets Cliff Way at its southern end. A female BARROW'S GOLDENEYE was also noted this week in the Ransom Beach area, west of Bayville. The Bronx-Westchester Count on Sunday totaled 120 species, highlights including two EURASIAN WIGEONS (single drakes at Turtle Cove in Pelham Bay Park and at Marshlands Conservancy in Rye), a female KING EIDER off Milton Point in Rye, three RED-NECKED GREBES, four BLACK VULTURES, ROUGH-LEGGED HAWK, a count period SEMIPALMATED PLOVER, LESSER BLACK-BACKED GULL, RAZORBILL, BARRED OWL, LONG-EARED OWL, NORTHERN SAW-WHET OWL, seven RED-HEADED WOODPECKERS with six of these at Pelham Bay Park, and five COMMON RAVENS. The female KING EIDER may have been the same one seen across Long Island Sound off Bayville yesterday. The Jones Beach West End NORTHERN SHRIKE was seen as recently as yesterday, east of the Roosevelt Nature Center. Seven HARLEQUIN DUCKS were also at the West End jetty yesterday, these often also moving across Jones Inlet to the Point Lookout jetties, where RED-NECKED GREBE was seen last Saturday. A LAPLAND LONGSPUR continues to be seen with Horned Larks and Snow Buntings at Jones West End, and of course SNOWY OWLS remain in evidence there and at many other sites, the amazing irruption continuing. The nice recent run of GLAUCOUS GULLS continues. One or two have been at Coney Island Creek in Brooklyn, with others at Bay Park in Baldwin Wednesday, Wolfe's Pond Park on Staten Island Saturday, and farther east, two continuing at Shinnecock Inlet and another at Hook Pond in East Hampton on Sunday. Other highlights out east have featured two TUNDRA SWANS continuing on Hook Pond, and a ROSS'S GOOSE found on the Montauk Christmas Count and still at Deep Hollow Ranch on Saturday. Some ICELAND GULLS have appeared recently, including one at Prospect Park Lake Thursday. RED-HEADED WOODPECKERS include one at Green-Wood Cemetery in Brooklyn Thursday and one at Caumsett State Park last Saturday. Lingering land birds have included CLAY-COLORED SPARROW on Staten Island Saturday, ORANGE-CROWNED WARBLER at Zach's Bay Thursday, and a BALTIMORE ORIOLE still in Central Park Wednesday, joined by a second one in the Ramble today. This service is sponsored by the Linnaean Society of New York and the National Audubon Society. Happy New Year! I thought I'd end the year's "Friday's Foto" series with something a little different. 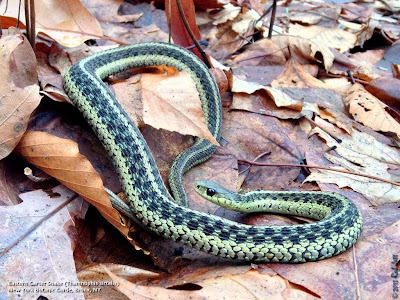 Last Sunday the weather was so warm, that during our Christmas Bird Count at the New York Botanic Garden, we came across this Eastern Garter Snake. During the Winter months they usually go into a hibernation-like state called brumation. This common snake is highly variable in coloration and marking. It is also somewhat difficult to distinguish from the similar Eastern Ribbon Snake. Here is an article that explains the differences. It began innocently enough. Heydi, Steve and I volunteered to cover the New York Botanic Garden for the annual Bronx leg of the Christmas Bird Count this past Sunday. As usual, Steve drove, but this year he had a family commitment and had to leave at noon. Rather than deal with the hassle of commuting back to Brooklyn from the Bronx via mass transit, Heydi and I decided to leave early, as well, and drive back with Steve. We figured that we would still have at least a few hours left of sunlight to try and find some end of year birds in Brooklyn. What we didn't count on was an MTA grand tour of said borough that would unfold after we left Steve. Dennis Hrehowsik ‏@deepseagangster - Glaucous Gull, Coney Island Creek Park in water behind Seagate homes. A Glaucous Gull in Brooklyn (or anywhere around New York City) is a rare occurrence. This species breeds in the high Arctic and, if you are a fan of nature documentaries, is the dominant gull you'd see flying around the far Northern scenery. In recent years I've been close to catching this bird in my bins twice in Brooklyn, but missed it by minutes both times. At first, I was reluctant to change my plans and race to Coney Island, as it would take a very long time to get there from the mass transit hole where we currently sat, but Heydi convinced me it could be done. 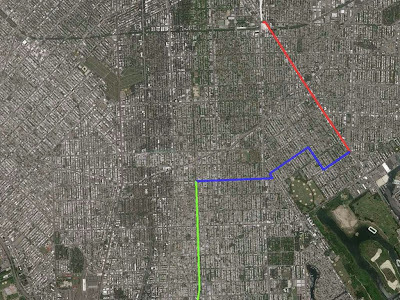 As we sat on the bus at Avenue H and Flatbush Avenue, we tried to calculate the fastest bus/train/bus/walking route. Then we received a message from our friend Keir that he was on the Q train at Avenue H heading to Coney Island and were we coming. By hook or by crook, my friend. If we got off the bus and back on the 2 train, we'd have to go backwards, to Atlantic Avenue, then transfer to the Q train heading back South. 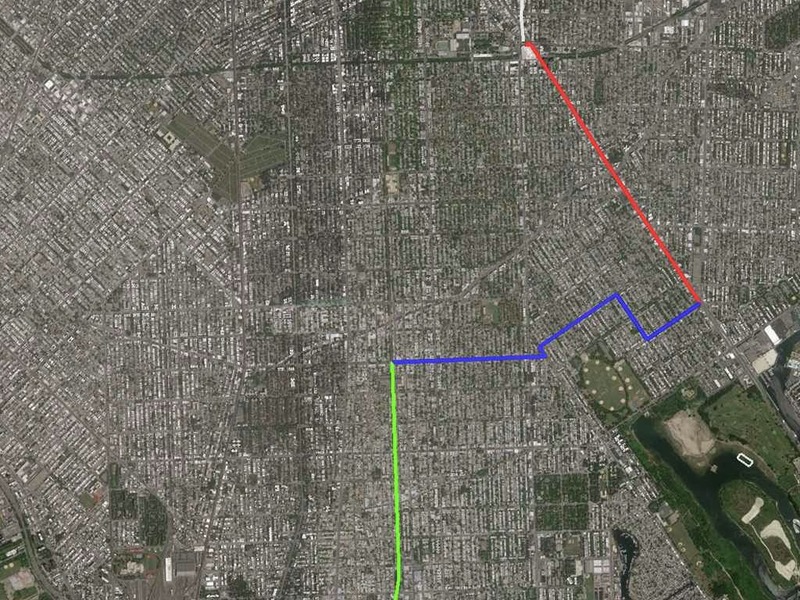 I thought that would take way too long, so Heydi suggested a few bus-to-train options that seemed a bit faster...if we timed the connections right. We stayed on the Q35 heading South down Flatbush Avenue. At Avenue S we'd transfer to the B2 bus, which would take us West, to the Kings Highway station of the Q train, which goes to Coney Island. As we were stopped at the traffic light near the intersection of Avenue S, we saw the other bus in the turning lane waiting for the signal to change. The Q35 stopped and we ran towards the bus stop around the corner, getting there just as the other bus was pulling in. As we settled in for the third leg of our trip, we checked our phones for any Glaucous Gull updates. Nothing. No news is goods news, perhaps. We were chomping at the bit as the B2 crept through traffic towards its final stop in front of the elevated train station. The signal indicating an incoming train was beeping, so we ran to the turnstiles at the Q train station and up the flight of stairs to the platform. The train was just pulling in. I called Keir from the train to find out if he had found the gull yet. He had just arrived at Leon Kaiser Park and still had a 15 minute slog down the beach until he got to the last spot where it had been seen. 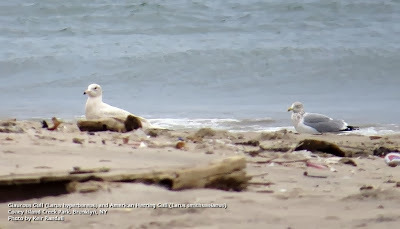 Normally, when I go to Coney Island Creek Park I'll walk the 1.5 miles from the train station, but not knowing if the Glaucous Gull was still around, we were concerned it might take too long. 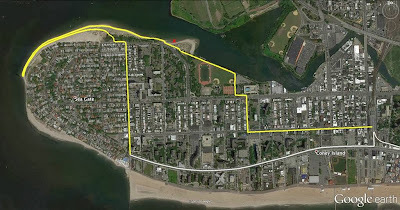 Heydi suggested that, if we time it right, we could take the B36 bus from in front of the Stillwell Avenue train station down to its last stop on West 37th Street and Surf Avenue in front of the Seagate community. That would save us about 1 mile. Luck continued to be on our side, as the bus was pulling up as we exited the train station. I called Keir from the bus to make sure the gull was still present. He told me that some people walking down the beach had flushed it, but that it just flew a short distance to a rock jetty and was still hanging around. He assured me that he'd keep an eye on the bird and wait for us to arrive. Several blocks from the end of the bus line the driver had to assist an elderly passenger and engage the rear lift gate so she could exit with her walker. The passenger exited, but then the driver had a problem with the automatic lift. It wouldn't retract. I could see Heydi sweating, as the driver repeatedly engaged then disengaged the mechanism. Five minutes went by before he got it working and we were back underway. It had started to rain lightly just as we exited the bus and headed North along West 37th Street. I called Keir again to double-check his location. 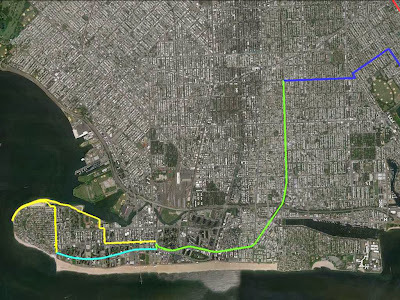 I learned that he was actually much farther to the South-West from Coney Island Creek Park than I had anticipated and right at Norton Point. It would be probably another 10 minutes of brisk walking once we got to the edge of the water. Keir was about 150 yards away, next to the rock jetty, and I gave him the "thumbs up", "thumbs down" signal to find out if the gull was still there. He didn't respond. Heydi's shoulders noticeably slumped down. I planted my tripod and scope in the sand and asked about the bird. "I looked away for a moment, when I looked back, he was gone", was his response. "How long ago", I asked. "About five minutes ago." I thought about the five minutes we lost while the bus driver fiddled with the lift gate. I wasn't about to give up, though, because I had just taken 2 trains, 3 buses and walked over a mile to see this arctic gull. We spent about 30 minutes scanning the water and the shoreline East and West of us. There were lots of Bonaparte's Gulls, Ring-billed Gulls, Great Black-backed Gulls and Herring Gulls on the shore and in the water. A lone male Surf Scoter preened in the water a few hundred yards to the South-West. Other expected waterfowl in the area were Long-tailed Duck, Bufflehead and Red-breasted Merganser. Farther out in the harbor a few dozen Northern Gannet patrolled and dove for fish and a single Purple Sandpiper sat on the jetty in front of us. I had dinner plans in the city at 6pm, so was quickly running out of time to find this bird. I suggested to Heydi and Keir that, perhaps, it was back near the sand spit in Coney Island Creek. Large numbers of wintering gulls roost at that location and we were getting close to the end of the day. The train station was back in that general direction anyway, so I started walking. Those two hung back, scanning and rescanning the water in Gravesend Bay for a large, all white gull. As I walked I noticed that many more gulls were along the beach than when we first arrived. Every 20 yards or so, I would stop, plant my scope and scan the flocks ahead of me. At 3:24pm I received a text from my buddy Sean, who knew I was chasing after the gull. "Any luck", he wrote. I typed back, "No", then my went back to scanning the gulls up ahead. Five minutes later I focused in on a large, all white gull walking in shallow water near the sand spit. It was the Glaucous Gull. I turned around and started waving my arms at Heydi and Keir. Not sure if they saw me I called Heydi, whose phone was busy because she was calling me. I hung up and answered her call. "I got it", is all I said, then saw her running down the beach, leaving her scope with Keir. Thankfully, the gull was still present when a very much out of breath Heydi put her eye up to my scope. "I need to get a photo", she said, so we continued down the beach. As some point, just short of the sand spit and the last spot where we had seen the gull, it disappeared. I'm not sure how an individual bird that is so conspicuous among our common species could just vanish, but I no longer had the time to figure it out. I packed my scope and bins in my backpack, slung my tripod over my shoulder, wished my two birding buddies a happy holiday and trudged off to the F train and home. So to summarize the use of my Metrocard on Sunday, I took the R train, Q35 bus, B2 bus, Q train and B36 bus (also took the F and D trains that night). Any New Yorkers who are familiar with the transit system would probably agree that it was truly a Christmas miracle that I actually managed to find my bird. 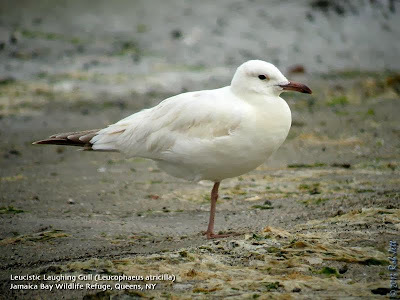 The Glaucous Gull was my 251st species in Brooklyn for 2013 and my 305th Brooklyn life bird. Here is a good video on how to separate the Glaucous Gull from the similar Iceland Gull. Plastic-foam food and drink containers in New York are set to go the way of trans fats and smoking in bars as the City Council voted to ban them in the name of environmental responsibility. The Democratic-led, 51-member body passed the legislation unanimously yesterday in Manhattan. It prohibits restaurants, food carts and stores in the largest U.S. city from selling or providing single-use cups, clamshells and trays, as well as peanut-shaped packing materials, made from a type of thermoplastic petrochemical called expanded polystyrene. An amendment gives officials a year to determine whether the substance can be recycled in an “environmentally effective, economically feasible and safe” way. If not, the ban will take effect as passed July 2015. “This is a very important step forward to reduce the city’s solid waste stream, to reduce the amount of products that are out there that are dangerous and literally living on for half a century in our landfills,” Council Speaker Christine Quinn said at a City Hall news briefing prior to the vote. The foam ban is part of a slew of initiatives to make New York healthier and more environmentally friendly from Mayor Michael Bloomberg, whose 12-year tenure ends Dec. 31. Calling for the “environmentally destructive” substance to “go the way of lead paint,” Bloomberg proposed the idea in February alongside initiatives for more electric vehicles and a curbside food-composting pilot program. Almost 100 cities and towns, including San Francisco, Seattle and Portland, have banned polystyrene food and beverage containers, according to the Natural Resources Defense Council. New York’s ban pitted closely held foam-maker Dart Container Corp. and Restaurant Action Alliance, a group backed by the American Chemistry Council, a trade group representing chemicals and plastics manufacturers, against Bloomberg and the 24 council members who co-sponsored the bill. The foam doesn’t biodegrade and can’t be recycled, according to the mayor’s office. It makes up an estimated 20,000 tons of the city’s annual waste and contaminates the stream of recyclable metal, glass and plastics, the office says. A report funded by the American Chemistry Council valued annual sales of foam containers in New York at $97.1 million. It said the ban would in effect be an “environmental tax,” forcing businesses and consumers to spend almost double on replacements including other plastics, coated paperboard and compostable materials. The Bloomberg administration disagrees, saying “substantial research” it has conducted found the average cost difference per product would be $0.02. Bloomberg, a Republican-turned-independent, is the founder and majority owner of Bloomberg News parent Bloomberg LP. Mayor-elect Bill de Blasio, a Democrat, takes office Jan. 1. Saturdays, November 9 – December 28, 12 – 1 p.m.
Free Explore the Park's natural areas and learn how to look for amazing birds. Look, up in the sky, it’s a bird! But what kind? Take a tour and learn about the 250 species of birds that call Prospect Park home. Greetings. This is the New York Rare Bird Alert for Friday, December 20th 2013 at 9pm. The highlights of today's tape are VARIED THRUSH, BLACK GUILLEMOT, BLACK-HEADED GULL, ROSS'S GOOSE, NORTHERN SHRIKE, KING EIDER, TUNDRA SWAN, GLAUCOUS GULL and Christmas Count results. A very striking male VARIED THRUSH found last Sunday in Stuyvesant Town in lower Manhattan was still present today. The thrush has been frequenting the trees and shrubbery around Stuyvesant Oval which is the center of the Stuyvesant Town complex. This area is east of 1st Avenue around East 19th Street but finding the thrush can be tricky but definitely worth while once located. The BLACK GUILLEMOT found last Friday around the Shinnecock Inlet jetties was still present at least to Monday and a BLACK-HEADED GULL was spotted among the Bonaparte's Gulls in the inlet today. Also at Shinnecock have been 2 immature GLAUCOUS GULLS as well as immature ICELAND GULLS. 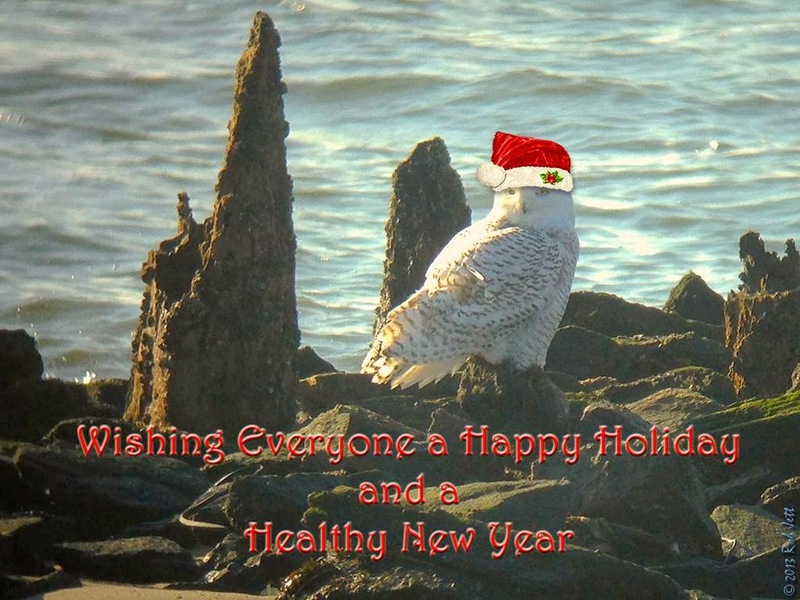 SNOWY OWLS continue along Dune Road and elsewhere as exemplified by last weekend's Christmas Count totals that included 15 in Brooklyn, 5 in Queens, 14 at Captree and 11 at Montauk. The count field Saturday recorded lower than usual numbers due to the stormy weather but did produce some good sightings. Brooklyn Saturday recorded 110 species including 2 CACKLING GEESE, RED-NECKED GREBE, SEMIPALMATED PLOVER, RED-HEADED WOODPECKER, a NASHVILLE and 2 ORANGE-CROWNED WARBLERS and NELSON'S SPARROW. Montauk Saturday also netted 110 species including over 1,700 COMMON EIDER, 55 RAZORBILLS, a ROSS'S GOOSE on Montauk Downs Golf Course seen to Monday, 3 BALD EAGLES and 3 ROUGH-LEGGED HAWKS on Gardiner's Island, HARLEQUIN DUCK at Montauk Point and a NORTHERN SHRIKE at Napeague. On Sunday the Captree Count tallied 119 species featuring 5 EURASIAN WIGEONS, 2 RED-NECKED GREBES, NORTHERN GOSHAWK on Fire Island, ROUGH-LEGGED HAWK, PECTORAL SANDPIPER, GLAUCOUS GULL, 2 BLACK-LEGGED KITTIWAKES, immature RED-HEADED WOODPECKER, LAPLAND LONGSPUR, NASHVILLE WARBLER and VESPER SPARROW. Queens on Sunday recorded 118 species including a drake KING EIDER seen off the 59th Street jetty in the Rockaways, 2 GLAUCOUS GULLS, RAZORBILL, SHORT-EARED OWL, COMMON RAVEN, a NASHVILLE and ORANGE-CROWNED WARBLERS. The Greenwich-Stamford County Sunday featured 105 species with 4 TUNDRA SWANS, 2 BLACK VULTURES, BALD EAGLE, SNOWY OWL, NORTHERN SAW-WHET OWL and BARRED OWLS and 2 RED-HEADED WOODPECKERS. The Rockland Count Sunday featured 84 species with 53 BLACK VULTURES, 12 COMMON RAVENS and RED-HEADED WOODPECKER. Central Park on Sunday provided 62 species for the Lower Hudson Count including SNOW GOOSE, BALD EAGLE, AMERICAN WOODCOCK and BALTIMORE ORIOLE. During the week EURASIAN WIGEONS were seen on Saint John's Pond off Route 25A in Cold Spring Harbor, at Mill Pond in Centerport Wednesday and at Massapequa Preserve last Saturday. 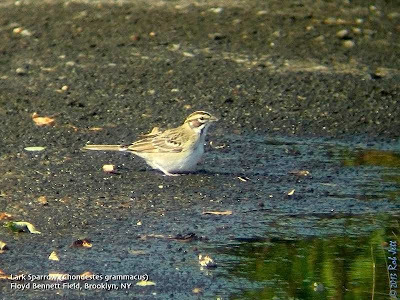 Two LAPLAND LONGSPURS were with Horned Larks on Floyd Bennett Field on Wednesday and another was in the swale at Jones Beach West End off lot 2 on Monday. A GLAUCOUS GULL was spotted a few times Thursday between Jones Inlet and the Point Lookout Town Park both on the beach and in the lot there. Unexpected Wednesday were 2 flocks of TUNDRA SWANS containing 10 and 11 birds reported moving by Jones Beach. A PIPING PLOVER was still near the Jones Beach West End jetty Thursday and an immature BLACK SKIMMER was also present that day. Two TUNDRA SWANS were also still on Hook Pond in East Hampton Wednesday and 2 RED-HEADED WOODPECKERS continued around Turtle Cove at Pelham Bay Park at least to Monday. In the book "100 Birds and How They Got Their Names", author Diana Wells defines the Horned Lark's scientific name (Eremophila alpestris) as, "loving mountain solitude". Who doesn't love a little mountain solitude, but in actuality North America's only native lark specie's preferred habitat is open ground, ie. fields, prairies, shores and tundra. In Brooklyn find them overwintering along the runways and grasslands of Floyd Bennett Field, sometimes associating with American Pipits, Snow Buntings and the occasional Lapland Longspur. Canada's tar sands are an unequivocal environmental nightmare, ravaging the landscape and spewing billions of gallons of toxic water into the world. Now, oil companies are claiming they've figured out what to do with all that poisonous water: Turn Alberta into one giant man-made lake district. Bloomberg has the story of Syncrude Canada, one of the major operators in the Tar Sands, which is currently embarking on a massive experiment called Base Mine Lake. "Lake" is a bit of a misnomer: Base Mine Lake is actually a former pit-mine that Syncrude is using to store the toxic water produced when bitumen is turned into diesel. What's the plan for protecting the surrounding world from this 3,000-acre pit of sludge water? Fort McMurray in Alberta, Canada. AP Photo/Jeff McIntosh. By letting it "clean" itself. Syncrude's scientists say they've spent two decades proving that "naturally-occurring microbes" in the water can actually break down the toxins and eventually support life. By covering the toxic water in 16 feet of clean water, they'll create a situation where the microbes can work undisturbed. So, in theory, this massive tailings pond—the term for lakes created by refuse from mines—will ultimately rehabilitate on its own. Environmental rights groups are questioning the empirical evidence at hand, pointing out that Base Mine Lake is 200 times larger than the largest tailings pond that the process has been tested on. And as Edmonton Journal points out, the approach is not without risks—based, for example, on the fact that thousands of ducks who touched down in one tailings pond died in 2008. On the other hand, Syncrude has had some success rehabilitating other former pit mines. Either way, it's an experiment. "One big concern surrounding end-pit lakes is that the contaminated water will spread through the boreal ecosystem, the tract of trees and marshland that stretches around the top of the world from Canada to Russia and Scandinavia. Boreal forests store almost twice as much carbon as tropical forests." Trucks carry loads of oil-laden sand after being loaded by huge shovels at the Albian Sands oils sands project in Ft. McMurray, Alberta, Canada. AP Photo/Jeff McIntosh. Did the writers of this popular show tap into recent media reports of Snowy Owl shootings for this gag? Focus: Quality birds and locations determined by the week's reports; otherwise, seasonal winter birds. Meet at Jamaica Bay Wildlife Refuge Visitor Center for an easy hike around the West Pond, gardens and upland woods. Learn how plants and animals adapt to winter, and look for waterfowl, owls, and wintering birds. This trip will be led by naturalist, Don Riepe. This program is in partnership with NYC Audubon and Gateway National Recreation Area. Guide: Don Riepe With Gateway National Recreation Area Meet at Jamaica Bay Wildlife Refuge Visitor Center for an easy hike around the West Pond, gardens and upland woods. Learn how plants and animals adapt to winter, and look for waterfowl, owls, and wintering birds. Barred, Long-Eared, Saw Whet, and Great Horned owls have been returning year after year to harbor in the pines and woods around the mansion. Also of interest are rare visitors such as Crossbills and Pine Siskins that may be migrating through. Enjoy the beautiful plants and wildlife of this hidden area that has been reclaimed by nature over decades of being closed to the public. Greetings. 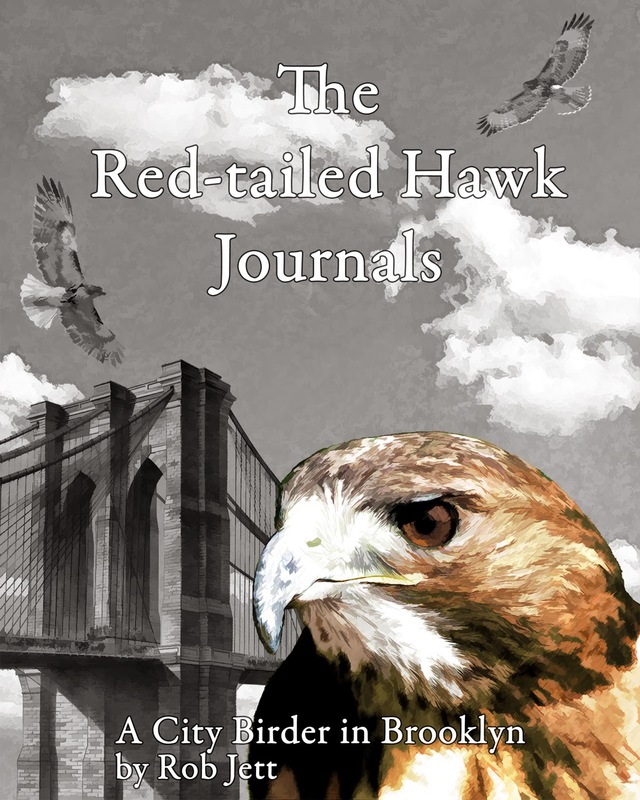 This is the New York Rare Bird Alert for Friday, December 13th 2013 at 8pm. The highlights of today's tape are GYRFALCON, BLACK GUILLEMOT, SNOWY OWL, NORTHERN SHRIKE, GLAUCOUS GULL, TUNDRA SWAN, GREATER WHITE-FRONTED GOOSE, HARLEQUIN DUCK, EURASIAN WIGEON and LARK SPARROW. On Thursday a gray GYRFALCON was spotted in the marshes slightly northwest of the Cedar Beach Marina on the north side of Ocean Parkway. This site east of Jones Beach and closer to but west of Captree State Park is in the vicinity of where a gray GYRFALCON spent about 3 weeks from last February to March 9th. Other than a reported sighting early this morning numerous observers at Cedar Beach today could not relocate the Gyr. But remember that last Winter it was a week after the initial sighting before the Gyr was pinned down at Gilgo. Today a BLACK GUILLEMOT was found in Shinnecock Inlet first along the eastern jetty and ultimately flying farther into the inlet around the west side jetty. Also at Shinnecock today were 2 immature GLAUCOUS GULLS and one immature ICELAND GULL around the jetties and at least 4 SNOWY OWLS along Dune Road. SNOWY OWLS do continue to appear especially along the south shore of Long Island but also at numerous other scattered sites and it will be interesting to see how many are uncovered during the upcoming Christmas Count and we very positively commend the fantastic response of the thousands of birders who quickly and effectively protested the killing of SNOWY OWLS at regional airports. Some owls showing the stress that brought them here in such large numbers have succumbed to starvation while others continue to be harassed at certain locations like Jones Beach West End. Please, let's give them room and zero additional agitation. The NORTHERN SHRIKE at Jones Beach West End was seen both days last weekend around the perimeter of field 2 and other birds at West End featured 3 BLACK SKIMMERS and 45 AMERICAN OYSTERCATCHERS while among the roosting shorebirds near Jones Beach field 6 Saturday were 2 RED KNOTS and  WESTERN SANDPIPERS. A LAPLAND LONGSPUR was with Horned Larks at West End field 2 today. Three HARLEQUIN DUCKS were by the western jetty off Point Lookout Town Park Saturday and 3 others were reported at Breezy Point Sunday. Three BALD EAGLES were at Hempstead Lake State Park Wednesday. The LARK SPARROW was still at Floyd Bennett Field last Sunday staying around the berm on the east side of the Cricket Field. Recent EURASIAN WIGEON sightings have included one on Saint John's Pond off Route 25A in Cold Spring Harbor Tuesday and one on the Mill Pond in Sayville Wednesday. Another was present last weekend on Hook Pond in East Hampton where 2 TUNDRA SWANS were still present today and a YELLOW-BREASTED CHAT was found there Saturday. An ICELAND GULL was also on the pond today. At Mecox Bay Sunday 3 immature GLAUCOUS GULLS were present around the flats there and feeding in the bay near Flying Point Road on the west side of the bay. An ORANGE-CROWNED WARBLER and 2 COMMON YELLOWTHROATS were also by the bridge before the last turn on Flying Point Road. Four GREATER WHITE-FRONTED GEESE were on fields on the south side of Further Lane on Sunday. Viewed with difficultly through the vegetation lining the roadway. This flock of geese does also at times cross over the road to the open fields on the north side. Single CACKLING GEESE were at Further Lane Sunday and at Deep Hollow Ranch in Montauk Saturday and a couple of RAZORBILLS were noted off Montauk Point Saturday. On the north fork a possible PACIFIC LOON was observed Wednesday off the causeway at Orient Beach State Park this very near Plum Island where one was reported last week. Please call in any confirming sightings. We will be happy to report local Christmas Count highlights so please call them in. 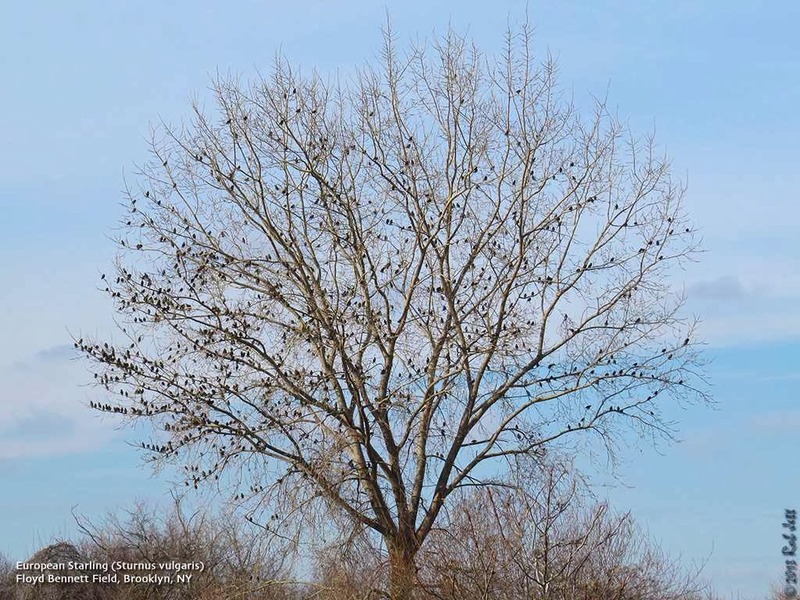 Looking a bit like ornaments on a tree, this is what nearly 1,000 European Starlings look like (actually 940, with a few Brown-headed Cowbirds mixed in). Between 1890 and 1891 the American Acclimatization Society released 160 of these non-native birds into Central Park. It is unclear how many of these releases failed, but the first breeding pair was eventually found nesting under the eaves of the American Museum of Natural History. Love them or hate them, they appear to be here to stay. Check out this interesting piece by May Thacher Cooke from 1928 on starling's spread through North America. Two weekends ago I was birding with Peter, Kevin and Klemens at Calvert Vaux Park in Brooklyn. As the afternoon wound down and it got close to sunset, Peter, Kevin and I started heading back to the subway. Klemens, however, decided to stick around and take some more photos. That night he sent me photos of a very unusual looking bird he discovered after we left. At first glance one might think that this is some vagrant exotic species, like a White-faced Robin, or somebody's escaped pet, but it is neither. 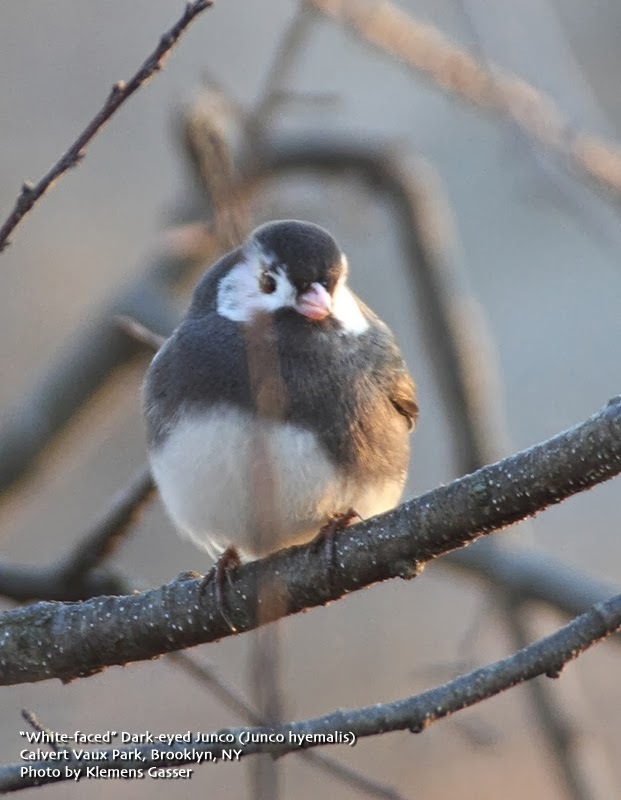 It is actually the very common Dark-eyed Junco. The white patches on this bird's face is the result of a genetic condition known as leucism, which is not that uncommon in birds. Over the two plus decades that I've been observing birds I've come across numerous interesting individuals that have caused me to scratch my head a bit before finally figured out the bird's identity. So what exactly is leucism? Simplified, it is a defect in pigment cells that results in either all cells failing to develop or just patches of body cells incapable of making pigment. This is very different from albinism, which results in the reduction of melanin production. Albinistic animals are easily differentiated from leucistic individuals by their pink eyes. It is interesting to note that albino birds are rarely seen because the lack of melanin in their eyes cause vision problems, usually leading to a very short lifespan. The website "Avian Genetics" has a brief comparison of the two conditions here. I was at Jamaica Bay Wildlife Refuge with my friend Steve Nanz when we spotted this distinctive gull standing at the edge of Grassy Bay. This was nearly 10 years ago and neither one of us had much experience with rare gulls (which we assumed it was). Returning to the visitor's center, I spotted Kenn Kaufman walking towards his car. I thought, great, if anyone would know what this gull is, he would. Kenn is very modest and his first comment was, "Well, I'm no expert." Yeah, right. He studied the image in Steve's viewfinder for a moment then suggested that perhaps it was a leucistic Laughing Gull. That night I posted a question and the image on the excellent, but now defunct forum called "Frontiers of Bird Identification". By the end of the week the general consensus was just as Mr. Kaufman suggested. Unlike the gull, this one isn't too difficult to figure out. What is truly amazing about this American Robin, though, is that he returns every year to Prospect Park in early Spring to breed. I first photographed him in 2008. To my knowledge, he was last seen near his territory next to the Upper Pool in 2012. I wasn't aware that robins had such a long life expectancy. 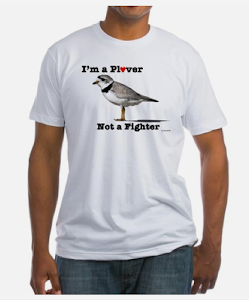 I can't recall how many times I was approached by non-birders to ask me a question about "an unusual bird that looks sort of like a robin", but I always knew exactly who they were referring to. If anyone has seen and photographed him in 2013, let me know. Leucism seems to be fairly common in robins, just check out the results of this Google search. In 2005 I went birding out at Jones Beach with Sean Sime and Joe DiCostanzo. 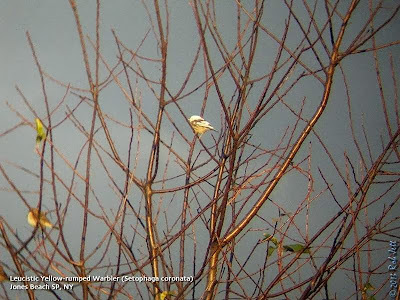 While scanning a flock of Yellow-rumped Warblers next to the Coast Guard Station we spotted this white-headed bird. (Sorry about the quality, I digiscoped it through my bins.) To my eyes, it looked like a Snow Bunting, but acted like a warbler. Had I not been with these two, very experienced birders, I probably would never have figured out that it was a Yellow-rumped Warbler. I find it fun spotting something out of the ordinary within our local bird populations, even if it is just a leucistic individual. On Brooklyn's Prospect Lake we also have the added challenge of sorting through a growing number of hybrid/leucistic waterfowl. If you have any pics of leucistic birds that you'd like to share, I'd love to add them to this collection. "Migrating Birds Know No Borders"
Flyways is a musical journey inspired by the great bird migration from Africa through the Middle East to Eurasia. The album is intended to awaken awareness of this ancient and miraculous migration, and of the endangered indigenous cultures of the migration route. Each spring, more than 500 million birds of 350 species follow the Great Rift Valley from southern Africa to Turkey, where they then diverge to Europe and Asia. This flyway is one of the most important bird migration corridors in the world. I first experienced the miracle of the migration when I flew in a motorized glider across Israel with the migrating storks as they soared on the thermal currents coming up from the Rift Valley below. From that unforgettable experience came the vision for this album: to create a musical chronicle of the birds' long journey, incorporating music from each of the cultures over which they fly, and weaving the voices of the birds into the fabric of the music. Read more here. For a complete listing of all the counts in New York State, click here. To find a Christmas Bird Count anywhere in the world, click here. Greetings. This is the New York Rare Bird Alert for Friday, December 6th, at 6:00pm. The highlights of today's tape are Pelagic Trip, featuring GREAT SKUA, NORTHERN FULMAR, RED PHALAROPE and more; the SNOWY OWL irruption; PACIFIC LOON, NORTHERN SHRIKE, WESTERN KINGBIRD, TUNDRA SWAN, KING EIDER, GREATER WHITE-FRONTED GOOSE, GLAUCOUS GULL and more. 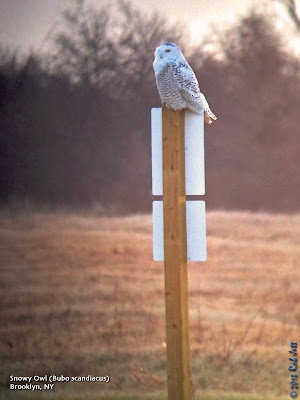 The SNOWY OWL irruption continues, with possibly unprecedented numbers of mostly immature bird occurring mainly along the South Shore of Long Island, with multiples present at such locations as Jones Beach West End, and Dune Road west of Shinnecock Inlet. Snowies have also been seen regularly in inland counties and away from the coastal shore at sites like Floyd Bennett Field; however, the birds at Jones Beach West End for instance have been subjected to continued harassment, and we can only ask again that people observe owls from a comfortable distance and do not disturb them. 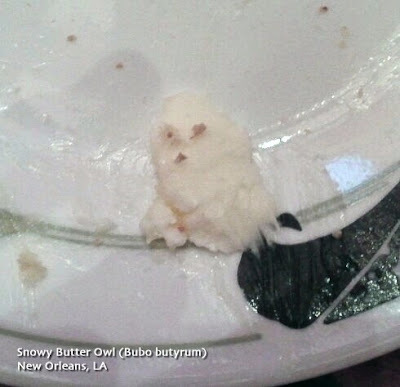 Some owls inland have already been found to be emaciated and have even died from starvation, indicating the great stress for survival that they are already under, so please keep your distance and do not add to their stress. A pelagic trip on a private fishing boat on flat seas last Monday got out to the continental shelf and enjoyed great views of a couple of GREAT SKUAS along with 14 NORTHERN FULMARS, 6 CORY'S SHEARWATERS, 13 GREAT SHEARWATERS, and 2 each of SOOTY SHEARWATERS and MANX SHEARWATERS, 65 NORTHERN GANNETS, 4 RED PHALAROPES, 2 RAZORBILLS, 24 BLACK-LEGGED KITTIWAKES, 1 ICELAND GULL, and 5 LESSER BLACK-BACKED GULLS. A PACIFIC LOON was reported Sunday in Huntington Bay off Hobart's Beach on Eaton's Neck. Seen briefly, the bird flew off and has not been relocated. [Addition from the Transcriber: There was a late report this afternoon of a PACIFIC LOON, seen on Plum Island while scoping Common and Red-throated Loons for a loon count]. A NORTHERN SHRIKE was seen frequently at Jones Beach West End field 2 from last Friday at least to Tuesday, often teeing up on trees and bushes around the parking lot, but also wandering off to locations such as the fisherman's parking lot west of the Coast Guard Station, or trees to the northwest or southwest of lot 2. A WESTERN KINGBIRD was seen again Monday on the North Fork in Cutchogue, just north of Oregon Road and east of Cox's Lane. Also out east, two TUNDRA SWANS appeared on Hook Pond last Friday and were still there at least to Tuesday. Five GREATER WHITE-FRONTED GEESE were on a traditional field on the north side of Further Lane in East Hampton Wednesday, and another was spotted Sunday at Van Cortlandt Park in the Bronx, where a GOLDEN EAGLE was a flyover on Saturday. An immature GLAUCOUS GULL and a young male HARLEQUIN DUCK were at Shinnecock Inlet last Friday, and a careful scan through the large scoter and eider flock below the bluffs at the Camp Hero overlook at Montauk Point State Park last Saturday produced a young male and two female KING EIDERS. An immature BLACK-LEGGED KITTIWAKE was on the North Fork at Southold Town Beach on November 28th. 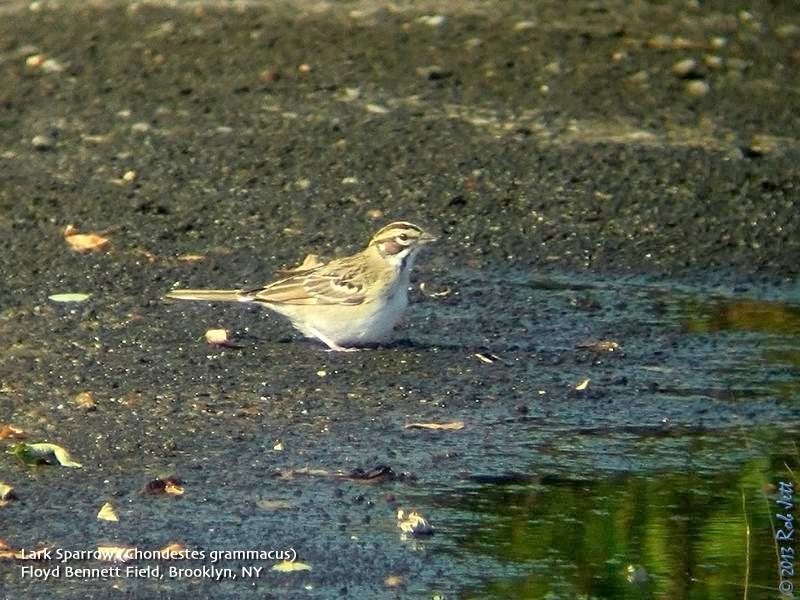 A LARK SPARROW was still around the berm, just east of the cricket field at Floyd Bennett Field on Thursday, and CLAY-COLORED SPARROWS were noted at Hendrix Creek in Brooklyn last Friday and in East Hampton Sunday. 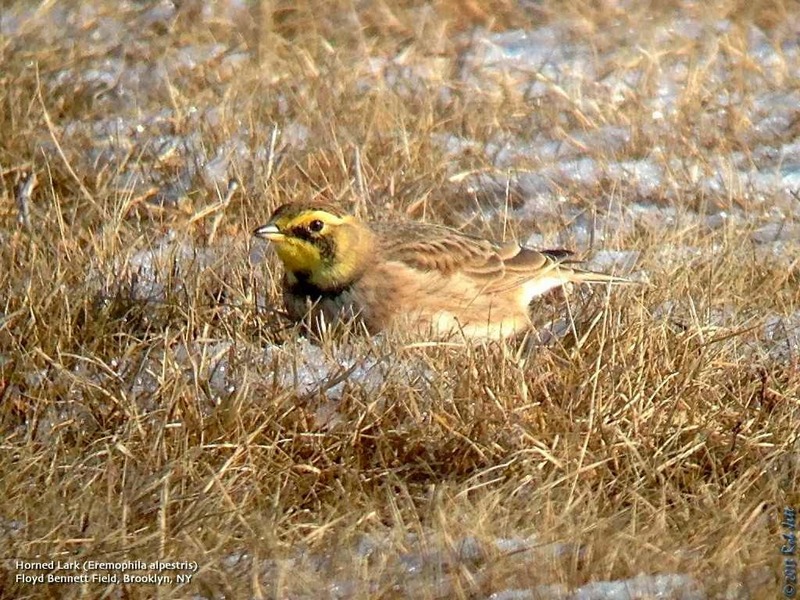 Single LAPLAND LONGSPURS were at Van Cortlandt Park to [last] Saturday and at Floyd Bennett Field [last] Saturday. Male and female EURASIAN WIGEON are occasionally being seen on the East Pond at Jamaica Bay Wildlife Refuge, where BARN OWL can still be seen in a box across Big John's Pond from the bird blind. A RED-HEADED WOODPECKER was still around Turtle Cove at Pelham Bay Park Sunday, and another was at Caumsett State Park Saturday, with a third now at Croton Point Park in Westchester County. A few RED-NECKED GREBES as well as ICELAND GULL and LESSER BLACK-BACKED GULL continue to be seen, and late was a PIPING PLOVER reported from Point Lookout Town Beach Tuesday. And thinking of the upcoming Christmas Counts, now is the time to start staking out some lingering land birds, like the ORANGE-CROWNED WARBLER at Mecox last Saturday [and another at Floyd Bennett Field on Sunday]. 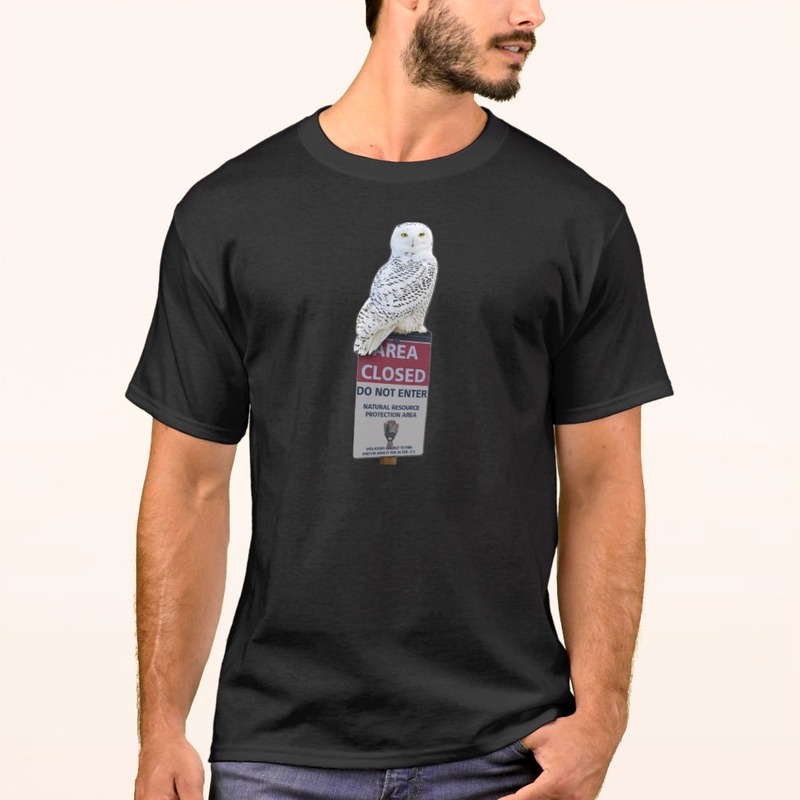 Snowy Owls are circumpolar, Summering North of the arctic circle. Unlike most owl species, they are primarily diurnal, hunting during the day for lemmings, ptarmigan and other birds and mammals. During Winters when prey becomes scarce, they will migrate far South of their normal range in search of food. This is one of those years and large numbers are being seen throughout the country. One was even spotted recently in Bermuda. Cornell's eBird website has a good piece about this phenomenon here. If you do come across one of these magnificent birds, please keep in mind that they are under a lot of stress, remain at a respectful distance, keep your pets leashed (they are known to kill animals that are quite large) and if you find one that is injured notify your local rangers, animal control agency or US Fish and Wildlife. During the month of November overwintering songbirds begin arriving at our feeders and around our city parks. Offshore waterfowl, loons and grebes settle in for the cold weather months. If a vagrant species is to show up around NYC, this is usually the month for it. The month saw some unseasonably warm days and the arrival of several immature Red-headed Woodpeckers around the area. 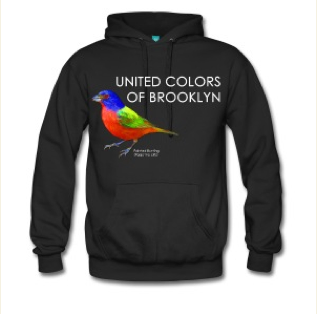 In Brooklyn they were seen in Green-Wood Cemetery, Marine Park, Owl's Head Park and Prospect Park. In my 20-plus years of birding I don't recall ever seeing such a large incursion of this nomadic species. Unfortunately, one individual in Prospect Park met an early end in the talons of a Red-tailed Hawk. See the video here. Kind of sad, but it the way of the jungle. Something always dies for something else to live. I went to Coney Island a few times over the month in search of scoters, gulls and buntings. I completed the triumvirate of scoters for the year when I added a Surf Scoter on November 2nd. 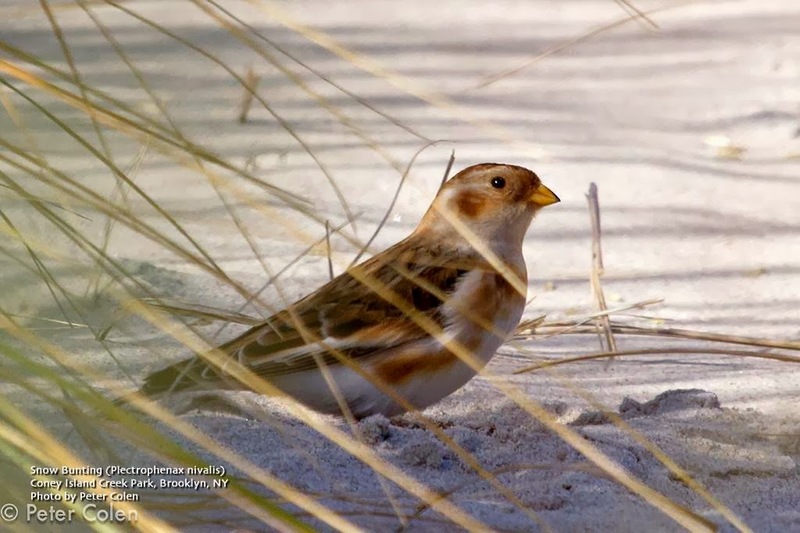 During a Brooklyn Bird Club trip I saw my first flock of Snow Buntings at Dead Horse Bay on the 9th, but also stumbled on a pair at Coney Island Creek Park with Peter Colen a week later, then spotted a flock of 25 at Coney Island on the 29th. These lovely passerines of the far North are one of my favorite Winter visitors to the city. One unexpected species spotted last month was a Lark Sparrow. I had all but written off seeing one this year as they are usually observed in September and October (if at all). When Doug Gochfeld called me about one at Floyd Bennett Field on the 25th, I wasn't able to bolt right out there, but kept my fingers crossed it would stay around for another day. It obliged me, in fact, it was still present near the cricket field as recently as Sunday. This sparrow breeds in open habitats, primarily in the central section of the continent. According to "Bull's Birds of New York State", they are a "rare but regular fall vagrant; occasionally in winter and very rarely in spring". This is a photo of one that I took a few years ago, several yards away from the one I observed last week. Given past unpleasant experiences, I generally won't give specifics or comment on owl sightings, so please don't ask. Here's a link to the American Birding Association's Code of Birding Ethics. 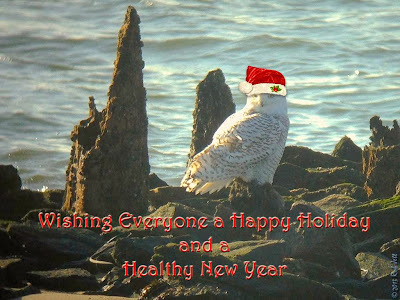 On Friday, though, I will be posting something about Snowy Owls. For the past 20 years, biologist and educator Stefan Sobkowiak has worked on transforming a typical apple orchard into an abundance of biodiversity that virtually takes care of itself. Located one hour outside Montreal, Canada, Miracle Farms is a 12-acre commercial orchard of which five have been converted to permaculture, and where trees, birds, bees, and other creatures all collaborate to help fertilize, pollinate, and maintain over 100 cultivars of apples, pears, plums, cherries, as well as countless herbs, shrubs and vegetables. Inspired by permaculture principles, this orchard is proof that a better, more regenerative model is possible for small- or large-scale fruit growing. We believe that this is a glimpse of what the future of fruit-growing can be. Guides: NYC Audubon Naturalists or Urban Park Rangers With the Van Cortlandt Park Conservancy, NYC Department of Parks and Recreation, and Urban Park Rangers. Meet at Van Cortlandt Nature Center. The history of birding and Van Cortlandt Park are inseparable. Influential birders such as Roger Tory Peterson and Allan D. Cruickshank got their starts on Van Cortlandt’s ecologically diverse grounds. These walks celebrate the tradition set forth by these great ornithologists. Participants will look for various species of residents and migrants and discuss a wide range of avian topics. For more information, please call 718-548-0912. No registration necessary. No limit. 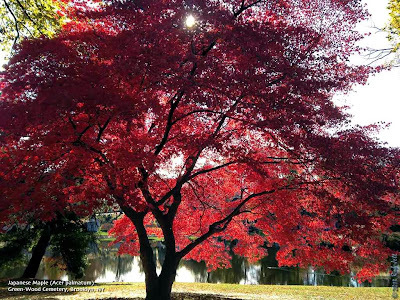 Saturday, December 7, 2013, 2:00 p.m. to 4:00 p.m.
Kingdom Pond Park, Arbutus Woods, Bunker Pond and Huguenot Pond Park are small parks in the lower Huguenot area. Though the endangered flower, trailing arbutus, is long gone, the area still is home to a number of plant and animal species. Meet along Kingdom Avenue (parallel to Huguenot Avenue above Hylan Boulevard) near the intersection of Jansen Street. Sunday, December 8, 2013, 11 a.m. to 2 p.m.
Join Hillel on a late autumn walk to the Cropsey Overlook through the woods of the central Greenbelt. Pass ponds and kettle holes and marvel at how ice formed this landscape ages ago. Meet at the High Rock Park parking lot at the top of Nevada Avenue. Rain postpones the event to the same time on Sunday, December 15. For more information, e-mail Hillel Lofaso at hillel5757@gmail.com or call 718-477-0545. 1. Register. Let leaders know you're coming! 3. Be advised if there are last minute changes or cancellations. These cannot be communicated to unknown persons. 4. Be on time! Most trips begin birding by 8am! 5. Please arrive before the starting time so we do not waste precious early morning bird activity. 6. Plan your travel time. The Urban Park Rangers will guide you to the best wildlife viewing spots in New York City. Feeling cooped up? Come stretch your legs as we explore the winter wonders of Freshkills Park. Learn about how what was once the world’s largest landfill is becoming a park.